No one likes looking at their phone every few minutes while it is charging, only to discover that the battery indicator has barely budged. While the 2017 iPhone models do offer fast-charging capabilities, owners of those handsets need to shell out some extra cash to take advantage of it. However, there is possibly good news on the horizon for those who end up buying one of the three rumored new iPhone units later this year. Images of what is said to be an engineering prototype of an Apple 18W, USB-C fast charger for the iPhone have surfaced. The accessory is expected to come in the box along with the 2018 iPhone units to be launched later this year. It will allow iPhone owners to refresh the battery inside their handsets faster than usual, and do so without requiring the owner of a new iPhone to make any additional purchase. 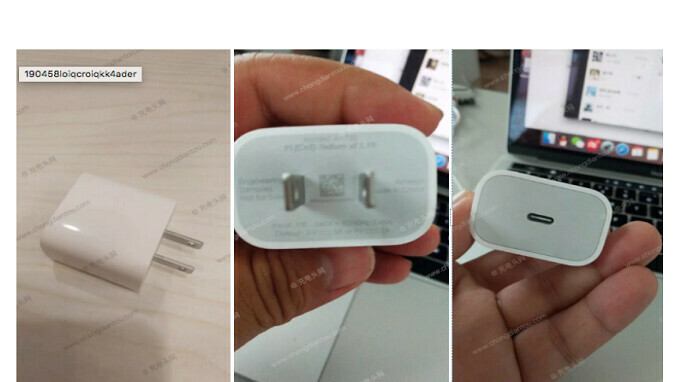 If this really is the charger that will come with the next iPhones, it is also safe to assume that the handsets will ship with a USB-C cable in the box. This would mean that besides charging up the battery inside an Apple iPhone at a faster rate, the switch to this new charger will also allow iPhone users to directly plug in their device to a MacBook or a MacBook Pro without the need for a dongle, as both of these laptops use only Type-C USB ports. The charger that Apple currently puts in the box with the iPhone weighs in at 5W, which is not enough power for the device to charge at its maximum possible speed. Apple did include fast-charging capabilities with the iPhone 8, iPhone 8 Plus and iPhone X, but the purchase of a more powerful charger with support for a standard called USB Power Delivery is required. Luckily, Apple just happens to sell one in the Apple Store (both physical and online) for $49. That is without the cable, by the way. The leaked 18W Type-C fast charger has a model number of A-1720 and is marked as an "engineering sample." This means if you're buying an iPhone for the first time and don't have a USB C port desktop/laptop you'll have to a buy lightning to USB-A cable if you want to hock up your iPhone to your computer. Will be interesting to see how the 3rd party cable market develops. Man I so wish they would just adopt USB-C, why can't they throw a bone to the people, at least once. Cause that bone costs money and they need it to bone their customers. Every laptop and computer today has had USBC ports. Every Windows, Chromebook, and many more systems come with USBC. As a matter of fact a number of Android OEMs started using USBC on their smartphones back in 2015. Now it's hard to find an Android smartphone that comes with anything else, except USBC. It's very easy to find one. Even some 250+$ phones have Micro USB. LOLOLOL love how you started your message. 'hard to find .. Android smartphone .. anything else, except USBC' is true in US. It is because the OPPO & VIVO were the only ones who refused to incorporate USB-C receptacle till three weeks ago (innovative high-end with sliding camera module). These phones was not shipped to the official channels in US. Oh wow congratulations bro, you must get wet dreams every night knowning it's only Apple who lag behind in USB C.
No, my laptop doesn’t. It’s now 2 years old. Or a usb c to a adaptor but who cares it won’t fast charge. I always have had problems with usb micro and mini. I hope they update the lightning to be a better interface then the usb-c. I like how the lightning port is a more solid unit. USB-c is more susceptible to dust in my opinion. Yes, now all Android manufacturers will follow in suit.. soon USB-A will be a thing of the past! Should be included to go with $900 price tag. Don't be silly this will help them get closer to that $2000 iphone. I've 2 questions! 1-How can I know that my iPhone X is fast charging? Does it show a symbol or a notification or something for it? 2-And can I use a non-Apple adapter for that(I've got a ravpower 4 port charging station with a QC 3.0 port and I also have my Galaxy Tab S3's quick charger) or it has to be an Apple Type-C adapter? Why did you bought the third class company product? You just need a android flagship... And your program will be sold. You will get everything that that you need in the box. The money, you left donated to someone who is poor. Remember, 'Apple' equate to 'Ripping customers left & right'. iPhone8/8Plus/X all support fast charging. Yet, Apple wants to rip its loyal customers as much as possible, hence only the 5W charger is included standard. You need to buy their USB-C charger (US$30) to fast charge your iPhone8/8Plus/X. Further, when all the high-end smartphones offer either 2K or 4K display, iPhone8 offers the very rudimentary 740x1440 which is far below the full-HD (i920 x 1080)! At $699 and above, if these practices cannot be called "rip off", what could? Include it in the box for free Cook.